Posted on 9/26/2018 by Lisa Plasky. 0 Comments. Six months ago, I was offered a handsome job opportunity as a Client Services Specialist with Michael Management Corporation, which I graciously accepted. During one of my first conversations with my soon-to-be new employer, a.k.a. SAP Wizard, I naively asked, “So, ‘SAP’, is that pronounced like the word ‘sap’ or is it spoken as letters like ‘S-A-P’?” I received a chuckle along with the response, “That’s how I know you’re a newbie!” Thus began my journey into the vast and sometimes confusing and overwhelming world of SAP (which, by the way, is spoken as individual letters, S-A-P). In an attempt to gain some quick basic knowledge prior to actually starting the position, I googled until I could not see straight. SAP, simply put, stands for “Systems Applications and Products in Data Processing”. Ohhhh, okay. Wait, what? Apparently, my self-proclaimed glowing Customer Service background and top-notch computer skills were just a small portion of what I would need to bring to the table in order to succeed in my new role – in order to be of effective support to customers, I was going to have to know what I was talking about, know what they were talking about – I was going to have to learn the product, this “SAP”, of which I had zero prior knowledge. Well, I am here to say from personal experience: “Never fear!” I can attest that ANYBODY can learn SAP, you do not have to come from a certain educational or employment background, there are no prerequisites. Like anything that seems huge and overwhelming, the best way to approach learning SAP is to break it down into pieces – steps – in logical order. And that is exactly what I did (and continue to do, as I am still on my learning path). I started taking our courses from the very SAP beginner level and I can tell you they are very effective. New to eLearning (online courses), I was worried the training would be boring - I am not one to sit still and listen to someone talk or lecture or to just watch a training video, I feel I learn best hands-on, actually doing the activity as I learn it. I was pleasantly surprised to find the courses are very interactive, requiring you to follow along and reproduce what you are being taught, step-by-step. In no time at all, I learned that SAP is an all-in-one system comprised of modules that represent each department within an organization. It eliminates the need for separate systems and programs for each department, allowing everything to run much more efficiently. And from there, I was off and running! (Aren't you curious now about what we offer, how it works, and what you can get out of it? Check out these answers to some commonly asked questions about SAP training). 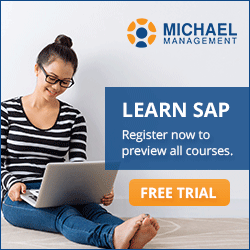 Here at Michael Management Corporation, our courses range from the absolute beginner of SAP basics, to advanced and career-specific SAP course programs. We also offer live SAP Access for practice once you have gotten some training and knowledge under your belt. Luckily, when you come to us for training, whether as an individual, or as part of a team with other employees, you are not on your own – we have a pretty great support staff who is always happy to help guide you on your training path. We also make it our business to know our product and which courses and programs will benefit your individual goals. We also feel that variety and keeping things fresh helps to keep students motivated and on track, so we also feature some other useful resources on our website such as blogs, webinars, and infographics, along with the option of participating in “gameification” (friendly competition among students) – we have also placed many informative video tutorials on YouTube. Ready to start looking into this SAP thing for yourself? Want to see what the beginner course program looks like in our SAP newbie land? Check out our Basic SAP Skills Courses designed for SAP beginners. Want to experience for yourself what our training courses are like? Register for free on our website then simply return to our SAP Course Library, click on any course and scroll down to the Lesson Plan. To the right of the first lesson you will see “Preview” – click on that to view the first lesson for free. That feature is available with all our courses so please feel free to explore and preview as many courses as you like! Want some more personalized guidance with putting together a training plan? Contact our fabulous, nowhere near all-knowing, but still-in-training and making great efforts and strides, Client Services Specialist, Lisa Plasky, and let her know your current skill and experience level with SAP and what your intended SAP career goals are. I happen to personally know she would be delighted to help direct you with getting started in SAP training! I would love to interact with other SAP newbies, please feel free to post your comments and questions below or send me a message. This is my first ever professional blog post, so show some fellow SAP newbie blog love by commenting below and sharing this blog post!